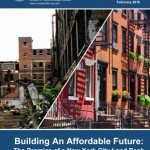 Explains how a land bank and a community land trust can be strategic partners to create a supply of permanently affordable housing. Explains the two-tier approach to CLT management that enables CLTs to scale up with central services that support grassroots CLT organizations. 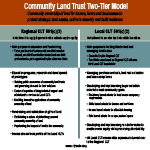 Berkshire Community Land Trust founding documents for the two tier CLT model. 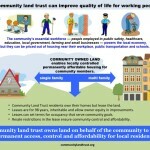 Info graphic explains features, benefits and impact of community land trust approach to affordable workforce housing. 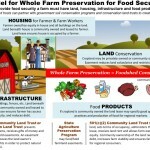 Info-graphic explains why farmland, and land for farmsteads, outbuildings and farmworker homes must be conserved together in an agriculture preservation scheme designed to foster food security. Schumacher Center for a New Economics Directory of Community Land Trusts in the United States and elsewhere. Discusses various uses of a community land trust and how different community organizations can cooperate to effectively enable land and farmland preservation, initiate community land use planning and create affordable housing. This book is the first documentation of the community land trust concept, originally published in 1972. Introduction to the 1972 edition of The Community Land Trust Handbook by Robert Swann. Discusses the evolution and historical precedents for community land trusts. Land Trusts as Part of a Threefold Economic Strategy for Regional Integration by Robert Swann. His threefold strategy includes land trusts, community development corporations and community money. Includes a discussion of key reasons why land trusts are advantageous in a strategy of regional decentralization. Alternatives to Ownership: Land Trusts as Land Reform by Robert Swann. Short discussion of community land trusts as a way to create long-lasting land reform. Land, Land Trusts and Employment by Robert Swann. He disputes Keynes’ approach to economic management, and offers the community land trust as a more effective vehicle for increasing employment in a region. 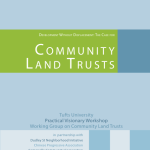 Clarifies the roles of the Land Trust in preserving farm land, and points to the potential for Community Land Trusts and Conservation Land Trusts to work together. The Nature Conservancy, the Community Land Trust in the Southern Berkshires, and two farmers form a partnership to save Indian Line Farm. Paper on how conservation land trusts and community land trusts can cooperate to save working farmland for working farmers. Sustainable Berkshires is an eight-part report produced by the Berkshire Regional Planning Commission and approved by the board of commissioners March 20, 2014. The report is a master plan for the future of Berkshire County, Massachusetts. Page 45 of the Housing and Neighborhoods section recommends the community land trust model as a top strategy for addressing housing needs.